This high-quality, heavy-duty stainless steel non-stick skillet set makes cooking a smooth affair. 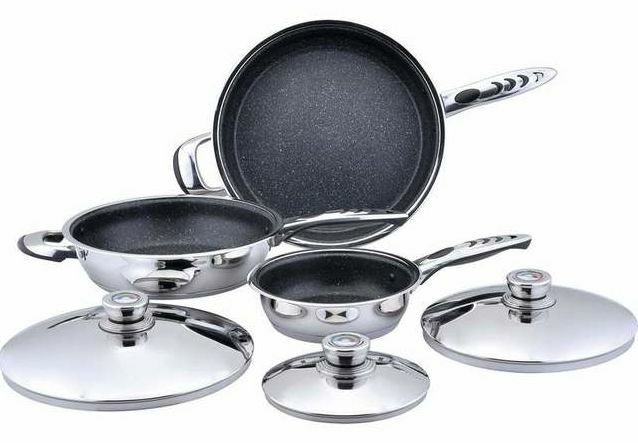 The set includes 12-7/8" skillet with helper handle and cover; 11" skillet with helper handle and cover; and 8-7/8" skillet with long handle and cover. Features non-stick coating, thermo control top knobs, stainless steel covers, and phenolic/stainless steel combination handles. Limited lifetime warranty. Gift boxed.